❶ Start with defining a shared vision of a desired future you want to achieve. ❷ Focus on long-term mutual gain and be ready to make short-term tactical changes in your plan if they help to achieve strategic success. ❸ Think holistically, keep the big picture of the desired future in mind and always remember that there are not just one, but many ways to draw it. 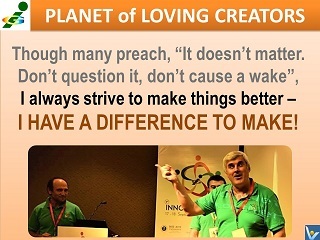 ❹ See yourselves not as bargainers, but as creators and strategic design thinkers who design a better future jointly. ❺ Be strategically flexible. 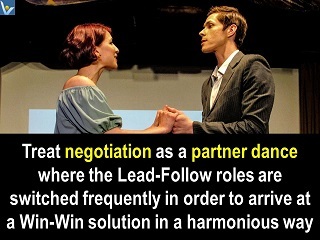 Keep your mind open to emerging strategic opportunities when you face a major road block in negotiations. Be ready to adapt your strategies accordingly to achieve a Win-Win solution. ❶ Adopt a Win-Win mindset that takes into account interests of the both parties. ❷ Define the area of flexibility and the “red lines” not to be crossed in advance. ❸ Practice mutual empathy. 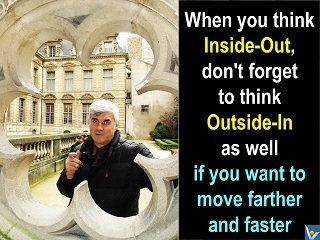 When you think Inside-Out, don't forget to think Outside-In as well if you want to move farther and fasters. ❹ Use “We” pronoun often to highlight cooperative effort towards mutual goals. ❺ Practice and enjoy creative teamwork to find creative solutions. 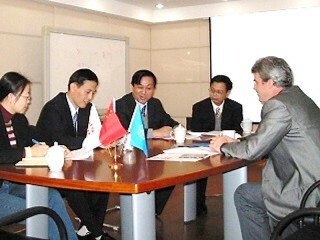 Joint creative efforts help the participants to both achieve greater results and to connect with each other at deeper levels, and thus to win both intellectually and socially. 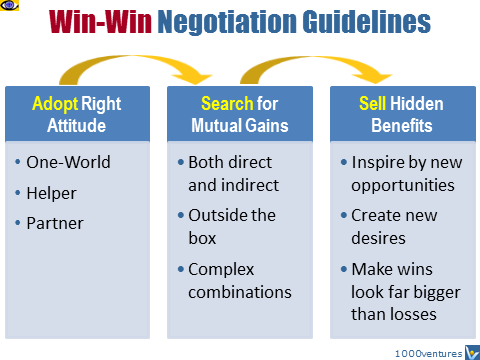 To me “Win-Wins” are greater deals. I strive that everybody wins.